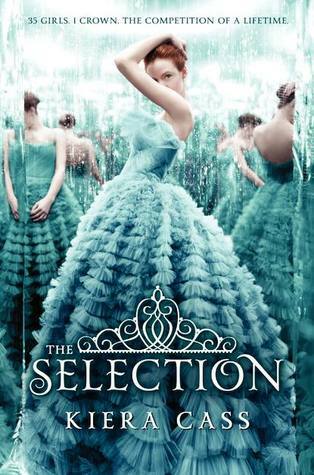 For thirty- five girls, the Selection is the chance of a lifetime. The opportunity to escape the life laid out for them since birth. To be swept up in a world of glittering gowns and priceless jewels. To live in a palace and compete for the heart of gorgeous Prince Maxon. Back to the book…on the whole Bachelor-esque premise alone, I was intrigued. (The beautiful cover pulled me in as well!) Then once I began reading the novel, I found myself not wanting to put it down. Kiera Cass has created a likable protagonist in America. In addition to that, I found myself quite liking both of her love interests. (Heck, who wouldn’t like a genuinely nice, handsome prince?!) I also appreciate that Cass added some depth to the novel with the events related to a war beyond the palace gates – not just a plot centered around girls vying for the Prince’s attention. I read the book in just two days, and immediately picked up the second novel in the trilogy. The final book in the series – The One – was released in May, and I will be reading it soon! If you’re looking for a light and fun summer read, and if you especially enjoy a nice dose of reality competition, then this is the book for you! This is a new, exciting, multimedia approach to learning and teaching Shakespeare’s plays. Shakespeare In Bits brings Shakespeare’s most popular plays to life through an animated re-enactment, full audio and unabridged text. Although there’s nothing quite like acting out and reading Shakespeare IRL, this application serves as a great supplement to the text. Right now the plays available through this app are the most commonly taught Julius Caesar, Hamlet, Romeo and Juliet, Macbeth, and A Midsummer Night’s Dream. This app was selected by Apple for its “High School Survival Guide”. It provides a quiz system with over 1500 grammar questions in 20 different categories (from basic parts of speech to infinitives and gerunds to S-V agreement). Students can take a “mock test” with real-time error feedback, which provides students with the opportunity to improve their strategies for grammar success. I really like this application because it uses pictures, colors, words, genres and different types of writing to provide creative inspiration for writers and writing students. Included in this application is a database of over 600 creative writing prompts in the form of quotes, story openers and writing exercises that can be used to jump-start student writing projects. This Parent’s Choice Award Winner elementary-level application allows kids to create and share ebooks and stories by adding drawings, photos and stickers. After the pages are designed, students record their own voiceover on each page and then share the story with friends, family and classmates. What fun! For younger students, this animated iPad app is a fun aid for learning the shapes and sounds of letters. In addition to watching animated sequences with voice-overs and sound effects for each letter, students can learn to write upper and lower case letters by tracing their shapes. Games for spelling and reading are also provided. Welcome to summer reading, where the sun gets in your eyes and the sand gets in your pages. 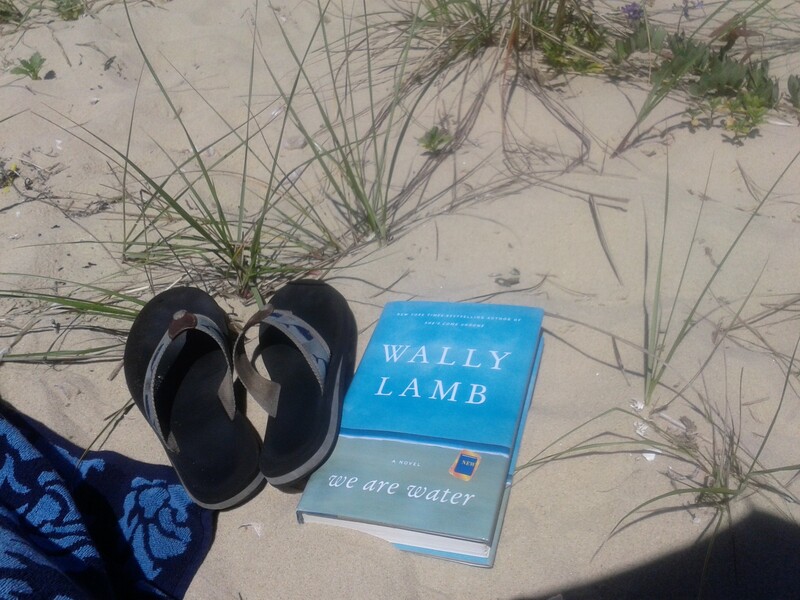 I just devoured Wally Lamb’s latest. He never disappoints. Even better, when I met him some years ago (must have been about 15? 20? years ago) he stopped signing books, stood up, announced to the entire line, this was my kindergarden teacher, Ms. ______ and he lauded her, hugged her, and basically made the entire line waiting for autographs cry. Good guy, that Wally. Anyway, this book was the perfect one to start my summer, since I’m up on Cape Cod visiting my parents, and this book partially takes place in Cape Cod, so the landmarks were familiar. I love to read books about places I am visited or places I’ve been. 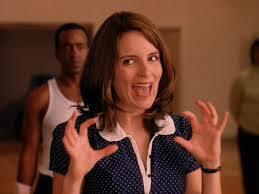 So the book takes a heteroglossic approach–multiple narratives telling the story. Annie Oh, the middle-aged, divorced artist, is about to marry her art dealer, Viveca, and she thinks about her past as she moves toward her future. Orion Oh, her ex-husband also considers their past together as he works through his more immediate issues and his unplanned exit from the field of psychiatry. We even hear from their three children: Marissa, an actress, her twin Andrew, a military man who has found religion, and Ariane, who manages a soup-kitchen. While much of the narrative focuses on the Oh family, there is also an additional thread of a story that links to them–the story of another outsider artist, Josephus Jones, an artist who used to live in the back of their property when it belonged to the wealthy Skloots. This book examines issues of race, gender, and violence while it also considers families, secrets, and forgiveness. The story also explores the repercussions of losing a loved one in a natural disaster. Lamb did some research about the big flood in Norwich, Connecticut in 1963 (although he creates a fictional town for the flood to occur in for the book) and includes the flood as a significant event in Annie’s young life. While at times the story felt a little predictable, I enjoyed the way Lamb tied everything together and ultimately closed with a satisfying ending. I remember reading his book about Columbine, The Hour I First Believed and thinking the same thing about the ending–I liked that it ended with hope. So if you want a story about families with complicated pasts that ultimately ends in a positive way, this is the book for you. I’ll also say, once I had a large chunk of time to sit down and read, I couldn’t put it down–the best kind of book to start the summer. So happy to be writing about this book. I stumbled upon it a few months ago and finally had the chance to sit down and read it. And when I say sit down, I actually mean that I read while working out on the elliptical machine while my infant son slept and late at night after he’d gone to bed. So, the blurb totally hooked me and practically begged me to read, and as I started the novel, I thought, “please don’t let me down.” And guess what? 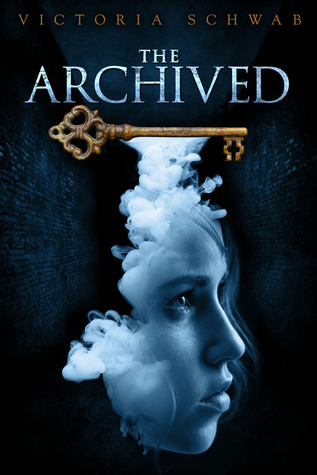 Victoria Schwab did not disappoint with this young adult novel. She has created a fresh and exciting premise with vivid, well-drawn characters. I’m going to quickly name the things that I enjoyed most about The Archived. 1. It ended up being a murder mystery. I love murder mysteries! 2. There is a little romantic sub-plot that I did not see coming. 4. There were a few twists near the end that I did not see coming. For a mysterious and fun read, pick up this book! 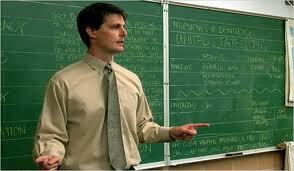 This week I thought I would review a few older movies about teaching/teachers for your summer viewing pleasure. 3. 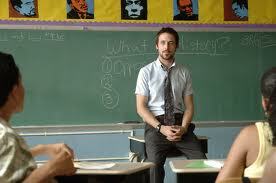 Half Nelson. I could write an entire book about all the complexities of this 2006 film about a young teacher, played by Ryan Gosling, who teaches in the inner-city and needs the help of one of his eighth-grade students to manage his drug addiction. 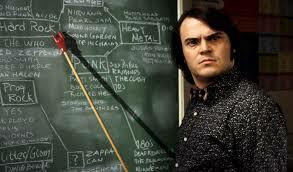 This film subverts a lot of our assumptions about race and gender and teacher stereotypes. Sure, Gosling’s character is a history teacher who engages his students and also coaches basketball, but he comes from a more messed up family than many of his students, and he can barely take care of himself, never mind try to “save” any of his students with his misguided attempts to do the right thing. A serious film, but worth delving into. 4. Chalk. This 2006 mock-umentary produced by Morgan Spurlock of Supersize Me fame is campy but compelling. The film follows 4 new teachers at a Texas high school. For any veteran teacher, some of these caricatures ring all too true. The absurdity of the situations and the realities of the profession will endear these characters to you. 5. Tenure. Luke Wilson teaches at a Pennsylvania college, but still has no publications and he’s up for review for tenure soon…so he’s trying to publish (or perish). There’s competition from a new colleague and there’s also issues with his father, who is in an assisted living facility. As a high school teacher, I found the last five minutes particularly powerful. Posted by Kate, VP Secondary. Summer is the time to catch up on all the books! But sometimes, summer is the time to re-read old favorites. I find myself drawn to re-read certain books every few years, especially if they’re books I recommend to my students a lot. 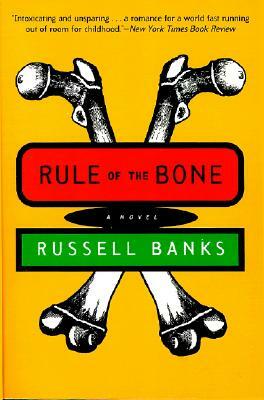 Rule of the Bone, by Russell Banks, is one of those books worthy of a re-read. I have described this book to many as the 90s Catcher in the Rye. My brother first recommended it to me, and I now hand it to many of my disenfranchised teenagers (especially boys) when they can’t find anything they want to read. There seem to be two parts to this story–the first part where Chappie leaves his mother and abusive step-father, searches for himself, gets a tattoo, takes the name Bone, and meets I-man, a Rastafarian, who leads him to the second part of his journey. In the second half, Bone goes to Jamaica, looking for his father (and looking deeper for his own identity). Throughout the book, though, Banks’s prose precisely captures the mind and heart of a sweet teenage boy who seeks meaningful relationships and a life worth living. One of the reasons I love this book so much is that Bone, while a teenager, is really self-reflective. I just love how Banks gives him these insightful observations, like: “But when you’re a kid it’s like you’re wearing these binoculars strapped to your eyes and you can’t see anything except what’s in the dead center of the lenses.” I think a lot of adults could relate to this book. It is definitely not Young Adult Fiction, it is adult reading, but I find many of my teenagers really appreciate reading it because of the verisimilitude. So enjoy your summer reading, and don’t feel bad about picking up a favorite book to re-read. Like Heraclitus says, you can’t step in the same river twice, and I think you can’t read the same book twice–because you always come to it as a different person. Rule of the Bone is one of those books I’ve read many different times as many different people. Recommended to me by a number of awesome teachers and authors, this was a book I’d been meaning to read for the past few months. As the end of the school year wrapped up, I finally found the chance to read it – over the course of a day, that is. Although the beginning felt a bit slow to me, I found myself dying to read more once I got about 10 percent of the way in (Kindle percentage). The two title characters are fully drawn and their story of “first love” reminded me of those butterfly-in-stomach-just-seeing-my-crush days when I was a teenager. Not a spoiler – The final sentence absolutely made the book! For a fun and fresh summer read, pick it up!